Ask Dr. Andro: "Does Adding Milk to My Tea Reduce Its Health Benefits or Destroy the Antioxidants? Is There a Difference For Black, Green and White Tea?" Image 1: Monkey milk tea by Conchibi. No matter how decorative it may look, according to various online sources, the milky monkey decoration is just about to annihilate the beneficial health effects of tea at the very moment it mingles with the antioxidant brew... or is this just another urban myth that is reaffirmed by 'gurus' all over the Internet? Question from Samir Banga (via Facebook): "Just wanted to ask you about tea and if adding milk or cream for that matter disturbs or destroys the antioxidants/good stuff in the tea. Also would this be the same with black, green and white tea?" Answer Dr. Andro: This is one of the typical cases where just typing in a question in Google produces either answer A "tea with milk = no problem" or answer B "tea with milk = worthless swill" - it just depends on how you formulate the question - or maybe who on whether the milk industry advertises with Google? Who knows.... A more thorough investigation, on the other hand, turns up a whole host of studies, the results of which are similarly conflictive. So what can we do to find out the truth? Well, we will do our very own little meta review. Sounds pretty sophisticated, doesn't it? Certainly something only Dr. Andro can do. Well, not really... take my virtual hand and I will show you that, oftentimes, you can easily answer your questions yourself, if you mix PubMed, Excel and some of your own gray matter and simmer that for a few hours. 138, a simple search for "milk in tea"
First thing we will do is go to the medical database of the US National Library of Medicine (www.pubmed.com) - and though I think that much of the dietary advice coming from the US National Institute of Health does more harm than good, the PubMed database comprises almost all medical papers that were published in any serious journal (not only the prestigious ones) from the realms of medicine, exercise, nutrition and beyond. On the PubMed website, we will type in the following search term "milk AND (coffee OR tea) AND (antioxidant OR polyphenol OR vitamin OR health)". It goes without saying that this will deliver all articles which deal with milk in relation to coffee or tea and their antioxidant, polyphenol, vitamin and caffeine content, as well as diverse health effects. Note: You may have noticed that, out of personal curiosity, I have expanded our complex search term beyond Samir's original question to another often overlooked yet similarly healthy caffeinated beverage, of which the average American drinks 3.1 cups each day - coffee! And since I have heard rumors that milk could also influence the pharmacodynamics, i.e. the absorption and effect, of caffeine, when it is added to caffeinated beverages, I also included the term "caffeine" in our complex request. Notwithstanding the complexity of the latter, the use of multiple key words and tokens for their logical connection limits the number of "hits", i.e. studies that match our criteria to 503 (cf. image 1). 1: Ryan L, Petit S. Addition of whole, semiskimmed, and skimmed bovine milk reduces the total antioxidant capacity of black tea. Nutr Res. 2010 Jan;30(1):14-20. 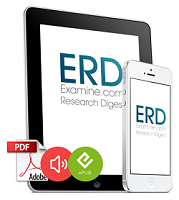 PubMed PMID: 20116655. 2: Reddy VC, Vidya Sagar GV, Sreeramulu D, Venu L, Raghunath M. Addition of milk does not alter the antioxidant activity of black tea. Ann Nutr Metab. 2005 May-Jun;49(3):189-95. Epub 2005 Jul 13. PubMed PMID: 16020939. 3: Leenen R, Roodenburg AJ, Tijburg LB, Wiseman SA. A single dose of tea with or without milk increases plasma antioxidant activity in humans. Eur J Clin Nutr. 2000 Jan;54(1):87-92. PubMed PMID: 10694777. And, lo and behold, all three are actually relevant to the question we want to answer! Heureka! Our initial euphoria begins to fade, however, when we have a closer look at the titles. While the most recent study (Ryan. 2010) claims that the addition of milk reduces the total antioxidant capacity of black tea, Reddy et al. (Reddy. 2005) and Leenen et al. (Leenen. 2000) in their studies, five and ten years before, found no reduction in the antioxidant activity of (black) tea.... well, I guess the question would not have been worth being included in the famous *hem* Ask Dr. Andro column if typing in a few words into a search engine would have delivered the correct answer right away*. * We will have to postpone the effects on caffeine absorbtion and differences between the effects of milk in coffee vs. tea on another Ask Dr. Andro column, though, because the titles of our search results suggest that there won't be any information on these secondary issues in the respective fulltexts. How to find a full text, if pubmed does not link to it? Usually the pubmed guys make it pretty easy for you to find the fulltexts to the studies their database contains. Normally, a single click on a button-like image of the logo of the respective publisher in the upper right corner of the pubmed sub-page with the abstract suffices, yet from time to time, the guy who fed the abstract into the database was to lazy to provide a link... and guess what, in case of the Leenen study, the button is missing. From the cryptic abbreviation "Eur J Clin Nutr. 2000 Jan;54(1):87-92" that is given in the line right above the title of the article and in the bibliographical information I provided, you do yet know that the paper has been published in 2000 in the 54th volume, 1st issue of the European Journal of Clinical Nutrition. Now, google will tell you that the "archive of " can be found at http://www.nature.com/ejcn/archive/index.html, and a few clicks later (year 2000 > volume 54 no. 1) you can download the study as PDF document, et voila! In essence, only objective #3 is relevant in the context of the question at hand; yet, knowing how to vary infusion times to maximize the antioxidant content of our tea, in the first place, would certainly be a nice bonus. Now, the penultimate of these 7 points should make you wonder, whether this would not distort the results, because adding milk to a previously diluted tea would of course produce reduced antioxidant values compared to an undiluted version without milk. Ryan & Petit were however conscious of this problem and used accordingly diluted samples as their references, which increased the number of samples the scientists had to analyze to 588. While obviously, the major results of this large scale investigation can be found in the text, the tables and figures the authors provide are of even greater value to independent thinkers like us. Using some sort of spreadsheet software we make good use of the 'raw' data on the influence of infusion times on the FRAP concentration of the freshly brewed tea. Instead of relying on the confusingly overcrowded and not very informative figure the authors provide, we create our own figure (figure 1) which comprises the FRAP values of tea 1 (median FRAP) and tea 2 (maximal FRAP) after 1, 2, 3, 4, 5 and 10min brewing with and without a tea bag. In that, we go beyond the simple graph Ryan and Petit had to offer, and bring to light how meaningful the negative effect of the tea bag in terms of the total antioxidant concentration of the brew actually is. Just because we are too lazy to tinker with the loose tea leafs we give away somewhere between 50% and 5% of the total antioxidant capacity (depending on the brand and infusion time of the tea). In that, it is interesting to note that the overall effect appears to be much greater with Tea 1 - as it can be seen in figure 1, the FRAP values of teas 1 and 2 are almost identical, if they are removed from the tea bag before infusion, which suggests that the quality of the teabag is an unexpected, yet important factor, when it comes to brewing an antioxidant rich tea. Altogether, these observations tell us that the use of teabags is generally not advisable, if you do not like the bitter taste long-infused teas tend to develop. As interesting (and surprising) as they may be, the insights on the effects of tea bags on the amount of antioxidants are not really relevant for our personal research question, which relates to the effect of milk on the antioxidant activity of tea. Now, before we even bother with the data analysis, imagine, we did not even have data on the antioxidant activity of the tea + milk mixture. In that case, the only, yet questionable way to decide whether the addition of milk reduces the anti-oxidant value of tea would be to analyze the antioxidant value of milk, which is something Ryan & Petit actually did, and do some basic volume-based calculations. Ryan & Petit found that fresh whole milk, semi-skimmed and skimmed milk had about 68%, 66% and 60% of the maximal FRAP value of (unbagged) tea and that these values declined by roughly 37.5% and 13.75% after 7 and 14days, respectively. Now, if we add a liquid with a FRAP value of say 5000µmol/L (fresh whole milk) to a brew of tea with a frap value of >8000µmol/L (Tea 1, leafs only) we will obviously reduce the total antioxidant level of the mixture. If we simply assume that the pre-cooled tea (20ml cold water added) has a FRAP value of 8000µmol/L (the exact reduction due to the addition of water would only matter, if the author had not used the 'cooled' specimen as reference, anyway), the addition of another 20ml of whole milk with a FRAP of 5000µmol/L would create a 11:1 mixture of high vs. low FRAP liquids, which would then have a FRAP value of 7.750µmol/L, which would obviously be a -3.125% reduction in the total antioxidant capacity of our tea by the addition of whole milk. The smart SuppVersity teacher and students that we are, we are without doubt aware that this basic calculation oversimplifies our "problem". Yet, imagine the scientists found that the addition of 20ml of whole milk did in fact reduce the FRAP value by no more than -3.125%. In that case, we would have a reduction, but that reduction would be meaningless in view of our research question, because overall you would even get more antioxidants from your 240ml of tea with added milk and water than from your 220ml of tea without milk. 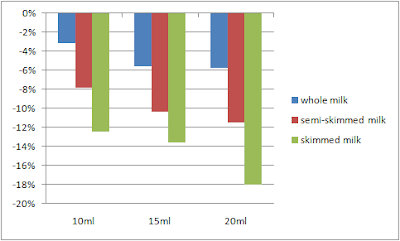 Again, we use our spreadsheet skills and create a graph that represents the relative changes in FRAP values that occur due to the addition of whole, skimmed and semi-skimmed milk to the tea (figure 2) and have to realize that our calculation underestimated the reduction by >2.6%. Consequently, there must be more to the effect of milk on the ability of tea to modulate ferric iron reduction than just a dilutive effect. And what's more, it must in one way or the other be related to the fatty acid content of the milk, with skimmed milk producing an effect that is 'only' 3x more pronounced than that of its full fat counterpart, although the individual antioxidant capacity of the latter is only about 8% greater. If we think about the composition of whole, skimmed and semi-skimmed milk two things which are closely related to the fat content come to mind: First, low fat milk contains more carbohydrates than full fat milk. And, secondly, the low fat variety also has more protein on a liter per liter base than its full fat precursor. On the other hand, previous studies Ryan & Petit mention in their discussion found a profound interaction of tea polyphenols and protein. Polyphenols can not only bind to proteins, but that the "interaction between flavonoids and proteins affects their antioxidant capacity in vitro". If you are interested in optics you will also know that skimmed milk derives its bluish tint from the absence of fat globules, so that only the rayleigh-scattered high frequency blue light from the casein proteins hits the retina of your eye. If you combine that knowledge with the findings of Luck et al. (Luck 1994) who found that proline-rich proteins such as casein have a very high binding affinity for polyphenols, the answer to the influence of the macronutrient composition of the different types of milk is apparent: The casein fraction which is particularly high in skimmed milk binds to the beneficial tea polyphenols and thus decreases its antioxidant capacity. Well, I guess this would be our answer, then: Adding milk to your tea is not advisable, because its protein content will bind the beneficial polyphenols. And yes, it would be, if there were not the two other studies our initial PubMed search had brought up, which report no effect of milk on the total antioxidant capacity of black tea? Is the newer study always right? Not one study is like another. The easiest way to tackle the conflicting data would be to assume that the 2010 study is likely to be more accurate than the 5 and 10 years older studies by Reddy and Leenen, but would that be scientifically valid? I don't think so. So what do we do? We take a closer look at the methodology of the Reddy and Leenen studies... it won't take us long to find that in contrast to the Ryan & Petit, both Reddy and Leenen analyzed serum samples of subjects after ingestion of the respective tea+water / tea+milk mixtures. This major, yet easily overlooked difference is of great importance, because it does not take a rocket scientist to know that one of the fundamental functions of our digestive tract is to disassemble the food we consume so that the cells in the endothelial lining of our intestines can absorb the nutrients and deliver them to our bloodstream. Analyzing the ferric reducing ability of human plasma after the subjects consumed a tea + water / tea + milk mixture is thus completely different from putting the mixtures themselves to test. With the influence of digestion, it is quite obvious that both the ingestion time, or rather the status of the digestive tract at that moment the subjects consume the samples, as well as the time at which the blood for the analysis is drawn post ingestion of the teas is of paramount importance. In both the Reddy and the Leenen study, the subjects reported to the laboratory fasted, and the studies also share some problems in regard of the tea preparation. Reddy, for example used only 280ml of water for the preparation of the tea to which then 70ml milk would be added. Since there is however a saturation level for the maximal amount of antioxidants a unit volume of water is able to hold, the 'no milk reference sample', which had been boiled in 350ml of water, probably had an (unfortunately unquantifiable) 'antioxidant advantage' over the 'milk sample'. In the Leenen study, on the other hand, the milk was just added to an accordingly reduced amount of tea (60ml milk to 240ml tea vs. 300ml tea), which does also reduce the overall amount of tea polyphenols, the subjects in the tea + milk groups were consuming. Both of these minor flaws could explain - to a certain degree - why the subjects exhibited slightly lower increases in serum FRAP (-17% Reddy; -23% Leenen smaller area under the FRAP curve sampled in four and five 30 minute intervals after ingestion of the sample, in Reddy and Leenen, respectively) when they consumed their tea with milk. So what? Does milk destroy the antioxidant value of tea? No matter how "scientific" these funky figures with 4 decimal places may appear - in essence the whole calculation did not only oversimplify the matter to a degree bordering bloggerish pseudoscience. It assumes, for example, a linear binding affinity, i.e. more milk = more binding, which obviously goes against what Ryan and Petit have found (cf. fig. 2). More importantly, though, it was also completely unnecessary in view of the fact that the 'missing' 3% we tried to explain are statistically non-significant, because standard error of the mean AUC (area under the FRAP curve) we based our calculations on is 19.64% and thus more than 6x above the loss we were going to lose our sleep over. And last but not least, there are the results of the Reddy study, which suggest that the effect is similar in both green and black tea. The effects discussed in this article are thus very likely occuring for the all forms of "tea" (a brew created from camellia sinensis leavey), regardless of how the leaves were treated before you put them into hot water.